I'm working on a radiosity processor in DirectX 9. I have efficiently rendered hemicubes from the perspective of texels within a lightmap. Now, as I try to integrate the hemicubes (to sum the incident light that can be seen from the POV of a single texel within the lightmap) I run into a problem. This tutorial says a hemicube is integrated by adding the colors from each pixel of the hemicube (after they have been scaled by the multiplier map) and then dividing the sum of colors by the total pixel count of the hemicube. The author says the sum of all pixels in the multiplier map should add up to 1... If this is true, why divide the sum of incident light by the number of pixels in the map? How is a multiplier map created? How should I handle the integration of hemicubes? During integration the hemicube pixels are scaled by the normalized multiplier map so that the incident color components will add up to a value between 0 and 1. The implementation of radiosity renders hemicubes to a 'master' surface that holds many hemicubes. When the master hemicube surface has reached capacity then incident light is calculated by integrating the hemicubes within the master surface, thus reducing calls to IDirect3DDevice9::GetRenderTargetData() and IDirect3DTexture9::LockRect(). A 'current hemicube' index is maintained and this index is stored within each LumelData struct for lookup during the call to CalcIncidentLight(). // storage vector to hold LumelData pointers for lumels whose hemicubes have been rendered to the master hemicube surface. This is a screenshot taken from the outside of a structure with 2 windows...At the moment the structure is shaded with the lightmap only! 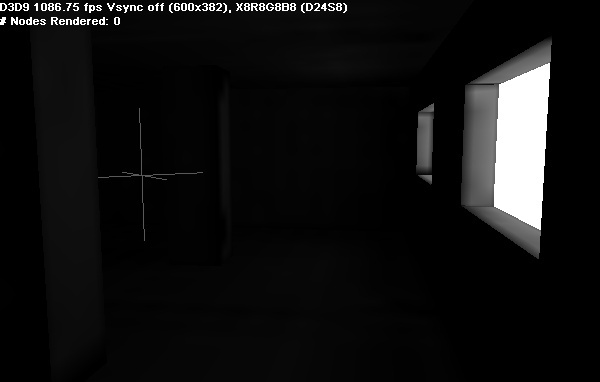 The skybox (all white textures for debug) surrounds the structure and is used as the only source of light in the scene. This is a screenshot from the inside of the structure. You can see very little light covers the geometry. If the walls inside the structure see very bright light (although in limited quantities), should I expect to see such miniscule amounts of light inside the structure? In the code you linked they also add another term which accounts for the perspective distortion of storing the texels in a cube which is rendered with 90 degree FOVs. This means that the samples near the seams are less direct facing. This makes sense if you think of the distance to a plane perpendicular to your viewing direction. It's closest in the center. So they combine these two terms together into multiplayer map. Finally, they normalize the map. 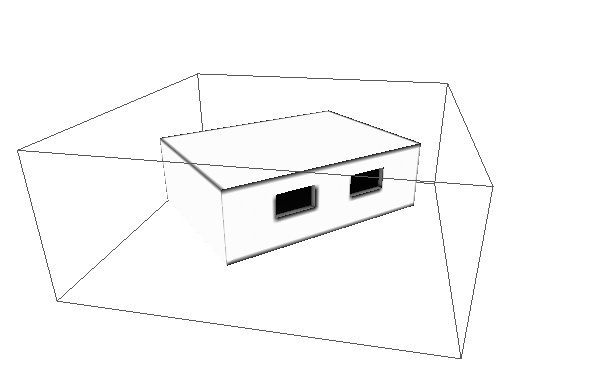 Since each hemicube is the same resolution you can bake in the constant 1.0 / ( hemicubeWidth * hemicubeHeight ) term. Not the answer you're looking for? Browse other questions tagged c++ directx9 radiosity or ask your own question.